The recent workshop at Khulna by Tittut, a Swedish puppet theatre group with Rakhal (Dhaka) and Rupantar (Khulna) theatre group focused mainly on puppet and shadow theatre. Organised by Sweden International Theatre Institute and funded by SIDA (Sweden's International Development cooperation), the workshop was a part of the project called 'Children's Voice'. 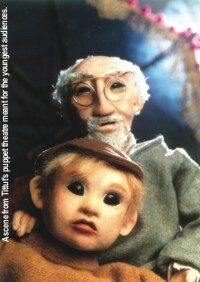 Courage, imagination, the will to find new paths--these are the hallmarks of Tittut, a puppet theatre company that has been performing for 27 years. In the '70s Swedish theatre for children experienced a boom and new theatres sprung up independent groups as well as regional stages. It was the best climate for theatre companies that worked with and for children, to flourish. The quarter-century long history of the group runs parallel with a revised and evolved view of young children. What prompted this effort to cater to the youngest audiences? Margareta Sorenson, a member of the group says, "No other small touring theatre company in Sweden had attempted such an approach. With time, however, attitudes changed and others caught up with Tittut. Today the general appreciation of the needs of our very youngest audiences is far greater. But it certainly took courage and eagerness to dare focus on the youngest audiences and then in fact, it still does," she adds. Why puppet theatre? Ing-Mari Tiren, an artistic director of the group says, "Because the youngest children (2-5 years) our audience finds it easier to identify with the small, puppet than with the big, adult actor. We use the hybrid form puppet/actor to have eye contact with our audience and the ability to interact on several levels." 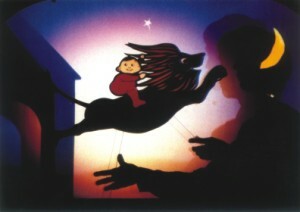 "Puppet theatre knows no boundaries -- everything is possible. Important ingredients in our work are clean, clear shapes and colours; clear and understandable language; rhyme and wordplay; nursery rhymes, ditties and songs; music and humour. We want to meet our audience with love and respect and make their first visit to the theatre an important and fun event for the very young," he says. In its 27 years of existence,the Tittut has produced a number of puppet shows based on stories that have become classics of the new 'few-year-old' culture. Picture books have often provided the basis or point of departure for the group's productions. "A picture, some text and then we turn the page. New picture, new text and so on," says Margareta. The Wild Baby, The Cat's Journey, Little Tiger and Little Bear, Little Sister Rabbit and Langel and the Horse are some of its best- loved pieces. Christer Dahldramatist, dramaturge, actor and a pillar of strength through the years, has transposed an extensive body of literature for small children into well-crafted plays. For its emphasis on colour and form, the spoken text is rarely central for the audience, but it is nevertheless a clear and powerful conveyor of the shape, thought, and world of the drama. Leif Hultqvist has composed the music for almost all of Tittut's productions: unique theatre music, mood-sustaining and actively participating in the action. Formally, it belonged to the modern puppet theatre of the late 20th century, with its free open stage space in which puppets and small figures interact side by side with puppeteers and actors. Prominent artists have contributed stenography and puppets. "International interest in scenic art for small children is considerable: it is seen as both new and modern, both as theatre art and as an expression of a contemporary, more egalitarian view of children. Nor has it avoided the big issues in life, like love and friendship, loneliness and doubt, fear and sorrow," Margareta says. 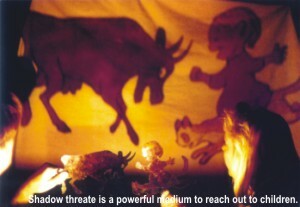 The world of puppet theatre is international in a radically different way from theatre in general. Tittut has toured abroad, performing in English or French as needed, or relying on the expressiveness of images and rhythm. It is an encouraging thought that this little theatre, sometimes called Sweden's national stage for the very youngest, has been one of the relatively few Swedish theatres to reach out and give other countries a picture of Sweden's rich theatrical life.